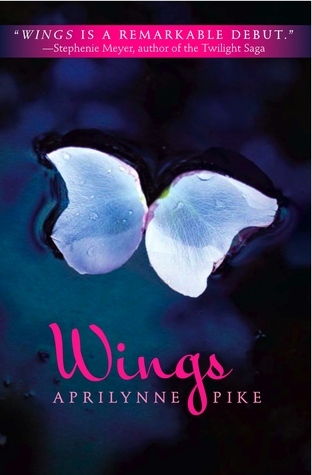 Wings by Aprilynne Pike was a fantasy YA book I recently bought. The book drew me in from the beginning. The awkwardness Laurel felt as she started school was very much believable. She was also a very believable character. Her friend David was even believable despite everything. When things begin to change for her the awkwardness and fear she felt was also very believable. What I especially liked was the fact that this was a faery book that was very different from others. The lore seemed to have been created from the author and I enjoyed that immensely, especially after reading so many books that followed traditional faery lore. I did find the Troll part to be rather strange though and could have done without that. All the characters were pretty decently well rounded. I did wonder about David some and the way he accepted things so easily, but that seemed to be his personality. The friends that Laurel make are especially easy to believe and instead of being there 100 percent from the beginning had their own problems as well that showed up. However, since Laurel and David were the main characters they did not take up too much space in the book. With that said, I thought the ending was a little different and I'm assuming there will be more books in the future because it ended with that very open note that made it possible for a sequel. The troll was never destroyed and there is a romance triangle between her, Tamani, and David. While the plot was decently predictable, it still had a lot there for the reader. I also found it to a fun read and enjoyable. I do hope that there are other books in the future because I do wonder what happens. So if anyone is looking for a light, fun, and intriguing read with it's own lore I highly recomend this. Over all I give this a 7 out of 10. I'd go for a 6.5, but I want to stick with whole numbers and a 7 seemed more suitable than a 6. The main character, Janie, is a very believable character in the start. She comes from a poor family and a detached mom. Her best friend is also from a similar situation, however doesn't really appear to be there for her. Which is apparent in the book. She then falls for a guy in her neighborhood who also has a similar situation. However, he's not so believable. If anything, he's almost too perfect in my opinion. Sure, he has his flaws. But over all I found him strange and not quite believable. The synopsis makes the book seem like it'll be a twister and full of suspense. But in my opinion it lacked a lot of that. There are a few psychotic dreams and they are described, but it just ends short. The one dream that was from a criminal wasn't until the very end. The struggles the main character Janie go through are also cut short and solved way to easily. Even when she gets together with her boyfriend, it goes a little too fast. There is an additional plot thrown in there with her boyfriend as well that just went too easily. The book is choppy, the way a dream would be at times, but I actually liked that part. I also enjoyed the way it started and how she feared students falling asleep in school and the flash backs of when she first started to get sucked into dreams. The problems it caused were very real as well. But again, she seemed to find a way to work with it way too fast. Over all, I would have to say this book developed a little too fast and in some ways would not quite believable. I would have liked to know more about her mom and would have liked a more believable boyfriend. His personality was mostly believable, but other parts revolving around him that show up in the book weren't quite so believable. I'd describe more, but then I'd give it away. It was an enjoyable read though so I'd give it a 5 out of 10. From the #1 New York Times bestselling author of The Da Vinci Code comes the explosive thriller that started it all. An ancient secret brotherhood. A devastating new weapon of destruction. An unthinkable target. When world-renowned Harvard symbologist Robert Langdon is summoned to his first assignment to a Swiss research facility to analyze a mysterious symbol -- seared into the chest of a murdered physicist -- he discovers evidence of the unimaginable: the resurgence of an ancient secret brotherhood known as the Illuminati...the most powerful underground organization ever to walk the earth. The Illuminati has now surfaced to carry out the final phase of its legendary vendetta against its most hated enemy -- the Catholic Church. Langdon's worst fears are confirmed on the eve of the Vatican's holy conclave, when a messenger of the Illuminati announces they have hidden an unstoppable time bomb at the very heart of Vatican City. With the countdown under way, Langdon jets to Rome to join forces with Vittoria Vetra, a beautiful and mysterious Italian scientist, to assist the Vatican in a desperate bid for survival. Embarking on a frantic hunt through sealed crypts, dangerous catacombs, deserted cathedrals, and the most secretive vault on earth, Langdon and Vetra follow a 400-year-old trail of ancient symbols that snakes across Rome toward the long-forgotten Illuminati lair...a clandestine location that contains the only hope for Vatican salvation. Critics have praised the exhilarating blend of relentless adventure, scholarly intrigue, and cutting wit found in Brown's remarkable thrillers featuring Robert Langdon. An explosive international suspense, Angels & Demons marks this hero's first adventure as it careens from enlightening epiphanies to dark truths as the battle between science and religion turns to war. The main character in the book was the Langdon, the same main character in The DaVinci Code. However, unlike a series, you did not need to read the previously published book to understand it what was happening. Much like the previous book, he was used for his symbology skills to help solve the murders. Langdon works closely with Vittoria, the daughter of the murdered scientist, to find out where the bomb is and stop the murder of the priests. There is some clear romance between the two of them, but the book does not center around it in any way. Rather is builds up on the mystery and suspense touching on the romance only enough until the very end. A lot of side characters are introduced in this book including the Roman Guard, Hassasin, and the Camarlengo. However it is not hard to keep track of all the side characters in any way. They add depth to the book and make it more real. I personally found the book very slow in the start. The author spent a lot of time building the suspense slowly and would section of parts in a certain characters perspective. There were sections for the Hassasin, Vittoria, and of course Langdon. He even had a section from a reports view, one or two of the Roman Guard, and the Camarlengo. While it was nice to have all these point of views, I sort of wished it went a little faster. However, it picks up pace rapidly towards the middle and end and I couldn't read fast enough to know what happens. So in many ways, the slow pace just made the ending even more wonderfully surprising. The end was quite a twist! What I especially enjoyed about the book was the fact that all historical locations and pieces of art, as well as the Illuminati, were based on fact. There's even a note on it at the beginning of the book. That just made everything much more real while reading it. All in all, despite the fact that it didn't quite captivate me in the beginning, it did win me over in the end. So ultimately I decided to give it 8 stars. My reasons for the 8 stars was the fact that it went a tad too slow in the beginning and I actually did want a bit more of the romance between the two. It's clear Langdon has feelings for Vittoria. But it's not really until the end that it becomes apparant that Vittoria has feelings for him in return. Then the romance went much too fast in my opinion at the very end. I do highly recomend the book though! 2. Learning through Reading Project: which is only in its beginning stages, but is all about 'active reading' and reviewing of favourite writer's style and technique. Second, I will be reviewing 'the gift' by allison Croggan as part of my 'LTR' project. Following this I will be reviewing the Book Thief (for LTR too), and other lighter books like 'Magic study' etc. Anyhoo, back on point. i want to apologise for the lack of activity on this blog. 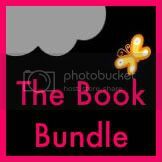 The Book Accomplice has done some great reviews and i really appreciate her help with keeping this blog alive.